It isn't hard to be enthusiastic about the Seattle music scene. Vibrant and varied, it offers indie pop, psychedelic, blues, metal, hip hop, electronic, pop, reggae, country and probably anything else your heart desires. Not surprisingly, in Seattle and everywhere else a lot of gems get lost in the shuffle, and that's where we step in; we champion the bands working for attention, and with the talent to deserve attention, rather plug someone with a big label contract. But even given our self-selected mission statement (and our steadfast and noble refusal to accept the under the table money and perks offered to us by the major labels), some bands stand out as more ready for prime time, more deserving of major exposure, than others. One of those bands is Tangerine. Yes, tangerine is a lively color and a nutritious snack. But Tangerine also is a Seattle band that deserves to be nationally known. Their range is impressive, from pristine pop to west coast indie rock. In Marika Justad (vocals/guitar/keys), Tangerine has a frontwoman with an incredible voice, powerful and equally capable of rocker girl mode or plaintive pop siren. Her sister Miro (vocals/drums), provides vocal support, and counterpoint, as demanded by the material. Ryan Baker (bass/vocals) teams with Miro as the band's rhythm section, and rarely do you hear a young indie band with a backbone so on point, so, well, consider it a party within the party. Toby Kuhn (lead guitar/vocals) possesses a remarkable range of guitar skills, and delivers confident shredding episodes that solidify the band's rock credentials. Moreover, the foursome seems tight knit, cohesive and, relevant in today's market, photogenic. Of course, the foregoing positive attributes might not mean much without good material, but Tangerine also write excellent songs. Their two 2013 EPs, Pale Summer and Radical Blossom, were stuffed with indie rock nuggets, with equal measures of ragged fuzz, sugar, gnarly rock and promise. Today, the band self-released the Behemoth! EP, a seven-track fulfillment of that promise. The ragged edges are trimmed a bit, but not so much that the band could be accused of abandoning rock. The performances are tighter, and the material is expertly crafted. Behemoth! starts out strongly with the bright and energetically chugging opening track "You'll Always Be Lonely", displaying the band's vocal and instrumental abilities, and loud-soft, fast-slow dynamics. The following "Tidal Wave" dials back the volume but delivers one of the sweetest songs of the set, and notable vocal interplay between Mariko and Miro. The previously released "Nothing Better" establishes the band's pop credentials in triumphant fashion. "I Fell Down", the fourth song has a wonderfully retro sound, with Mariko's yearning vocal lead and Toby's garage chord accents. Every time I hear it I'm tempted to ask someone to save me the last dance (you may now feel sorry for my secretary). The fifth track, "Tiny Islands" is a bright slice of garage with pop flourishes. "Runes" gives the rhythm section a chance to take the stage for the first minute and a half, and then the song explodes into indie pop perfection. Album closer, "Northern Line", is four and a half minutes of delightful dream pop. Three tracks are available to view/stream below. But you also can listen to Behemoth! EP on Spotify. And I urge you to do so because as good as those songs are, my current favorite tracks are "Tidal Wave", "I Fell Down" and "Runes". For those who are as impressed with Behemoth! as I am, the record is available at the iTunes link below. 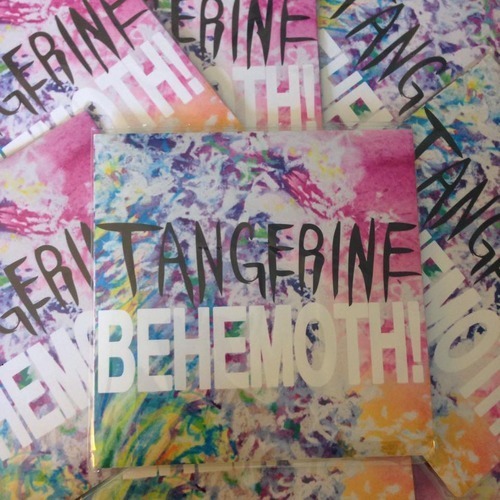 If you are lucky enough to attend a Tangerine show, there probably will be physical copies available as well.